Quality thermal transfer ribbons improve productivity. 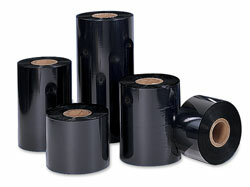 Thermal transfer ribbon is likely one of those supplies your company only thinks about when you need to buy more. Day in and day out you print barcodes using thermal transfer ribbon, with little consideration for the process. When you need more, Tri-State Business Systems is here to help. We carry Zebra ribbon, because we have found that the vast majority of the world’s most successful companies use Zebra barcode products. Zebra products are superior to its competitors, offering clearly printed and durable barcodes. Why is this important? When your employees spend extra time trying to get a barcode to scan because it is not clear, productivity is lost for your business. With Zebra ribbons the barcodes are easily scanned, thus improving productivity. If you are in the market for new ribbon, we recommend you try Zebra printer ribbons, however we also offer an array of other brands including TSBS and Sony® Printer Ribbons. Contact the experts in barcode supplies at Tri-State Business Systems today to talk to one of our customer service representatives about your needs. Let us match you to the right products. With our help, your business can improve productivity through clearly printed labels using thermal transfer ribbon.